Horrendous Conditions on Severn and Taff! The weekend saw Stratford upon Avon Boat Club athletes from across the age ranges compete on the Severn at Stourport. The 3600m course running with the stream presented a good opportunity for all to display the fruits of their winter training over a longer distance. Conditions on the day were challenging and although the rain stayed away, the sleet and strong wind presented the competing athletes with a real test of endurance. 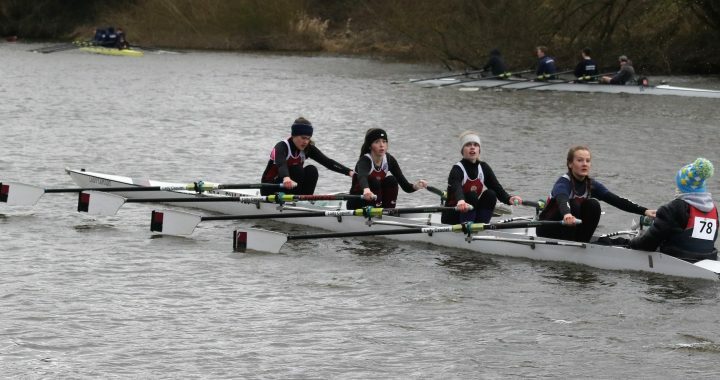 In Division One, first to go was the Women’s J16 coxless quadruple scull of Jasmine Mountney, Nixie Brunt, Mili Wilcock and Alice Baines. 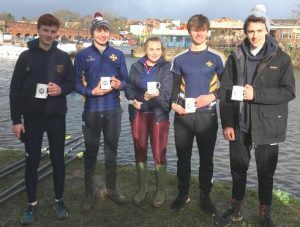 Rowing up an age group with J18 athletes, the crew set their mark on the event with a confident win. Next the J16 single sculler Fred Tyler braved the course missing out on the win by just one second to strong opposition from Trentham Boat Club. The third J16 sculler in the mix was Maiya James who despite the tricky conditions delivered a solid row and recorded third place. The J15 squad was represented in the coxed quadruple sculls event by crews consisting of Sienna Rawlings, Amelie Sartain, Julia Zampronio Gurden, Abbey Meggeson and Mary Walton (coxswain) first away and closely followed by Sophie Elstone, Harriet Hodgson, Martha Usselmann, Emma Harrison and Elisabeth Edwards (coxswain) second down the track. In the final analysis the Meggeson crew had the edge by just two seconds over their club mates despite a damaged rudder from the start. 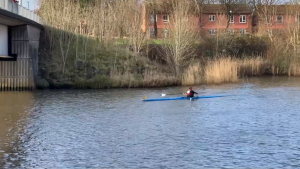 Fred Tyler also took the water for a second time, this time in the J17 category but once again was thwarted by the Trentham Boat Club athletes with another second place by the narrowest of margins. For the J15 squad it was an afternoon of the third place results with the double scull of Will Clarke and Conar Aitchison, the women’s double scull of Amelie Sartain and Martha Usselmann and the women’s single scull of Sophie Elstone all in the bronze medal position. In the J18 event, Dom Furey rowed the course with his typical flair ending in a solid second place. The women’s J17 double scull of Autumn Keil and Katie Phillips joined the J15 squad in the creditable third place against strong competition. King Edward VI School’s squad competed alongside sister club Stratford at Stourport Head in testing conditions of cold and gusting wind. 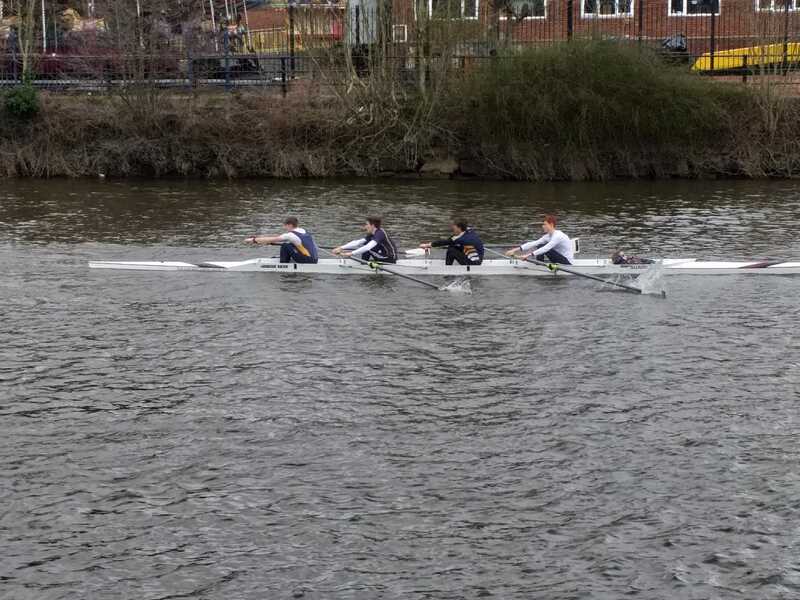 First to boat was the boys’ four of Joe, Cameron, Adam, Felix and Lara for a first race in this combination. The long wait to start meant the crew used the time well to warm-up and drill, letting them settle their technique for the race despite never having raced together before. 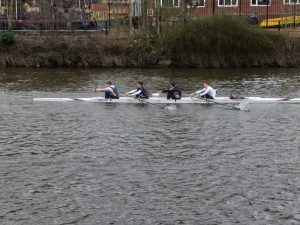 Up against crews from Warwick and Stourport, they quickly left the Warwick crew behind to maintain a distance from Stourport (also a J17 crew) and were awarded joint first place. Next to boat was Fred, a J16 sculler in his first race for this squad, in a single. He coped well with the conditions which tested all of the single scullers and raced a good line, maintaining his long stroke against other boys who included a Great Britain trial athlete. No medal for Fred on the day but he showed his potential for the squad. For DP Photos excellent select for Stourport Head, please see https://www.dpphotos.co.uk/Stourport-Head-Div-2-Jan-2019. Posted in News and tagged King Edward VI School. ← ‘Comfortable’ Outing at Northampton!